This is one wardrobe spring cleaning which has epic and historic significance – not just an expansive overview of a legendary couturier’s work but also a paean of a designer and his muse’s lifelong friendship. Catherine Deneuve, the iconic actress of French cinema and embodiment of classic French style is selling her Normandy estate, which happens to house her staggering wardrobe of Yves Saint Laurent outfits from the past four decades. A collection of 130 haute couture pieces the designer made for his favourite leading lady will go up on the auction block at Christie’s this week in Paris. An additional 170 of her YSL pieces will also be offered in a special online auction from January 23rd to 30th. The sale is timed to coincide as Paris Haute Couture Fashion Week goes into full swing. Catherine Deneuve and Yves Saint-Laurent at his 30 year anniversary celebration in 1992. Up for bids are pieces from some of the highlights of the actress’ career and the noteworthy moments in the YSL canon – his legendary Ballet Russes collection, the gown she wore to collect her 1993 Golden Globes award, and of course, several of his le smokings. While most designers have muses, only a handful of these relationships has such star power to forever link two artists in fashion history. Givenchy will always be associated with Audrey Hepburn. Karl Lagerfeld adored Coco Chanel look-a-like, the model Ines de la Fressange – until they had an epic dustup in 1989. Jean Paul Gaultier will forever be intertwined with Madonna. 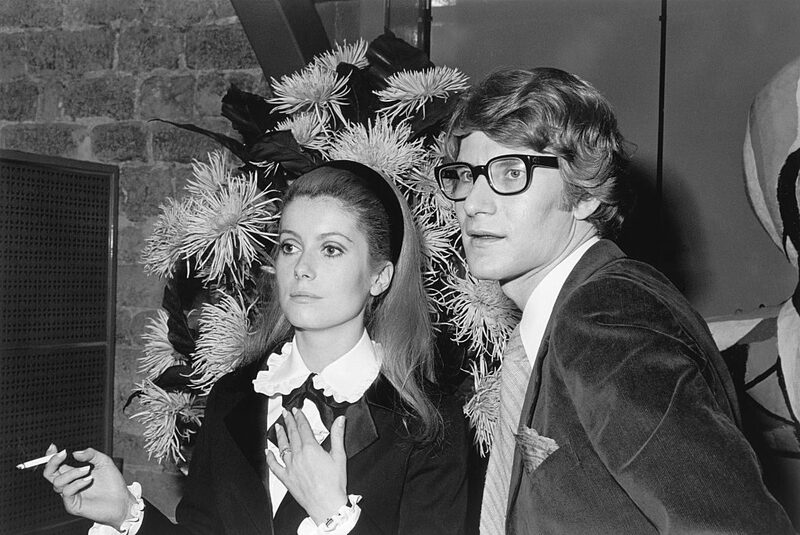 French actress Catherine Deneuve stands with fashion designer Yves Saint Laurent, for whom she sometimes models. Getty Images. The beginning of the working relationship and friendship shared by Deneuve and YSL began back in the 1960s and only ended with the designer’s death in 2008. The pair first met when the 22-year-old rising film star needed an evening outfit to wear when she was presented to Queen Elizabeth in 1965. After that first collaboration, the designer worked on the costumes for one of Deneuve’s seminal film roles, the 1967 classic, Belle de Jour. The designer’s rise to fame as one of the world’s revered couturiers would lead him to have other muses in his life but the movie star was perhaps his most famous and was a fixture, not just in the front row at his shows in Paris but in his personal life. Yves Saint-Laurent (C) taking his final runway bow, along with Catherine Deneuve (R) at his last Haute-Couture show in 2002.. Getty Images. Below are a selection of outfits available for bidding in the online portion of the auction. Please consult christies.com for a full listing of the items up for sale and details on how to place a bid. 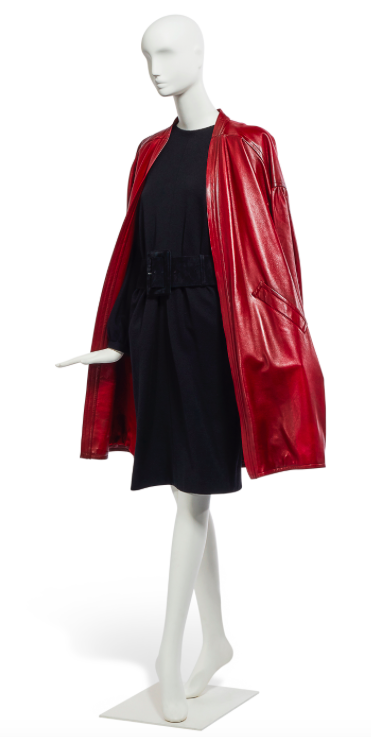 Burgundy leather coat with black wool dress from YSL Haute Couture Spring/Summer 1981. Estimate CDN $502 – $669. 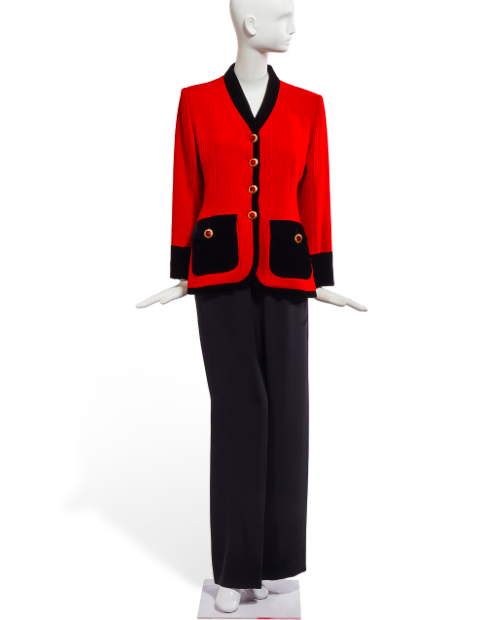 Silk jacket with wool skirt from YSL Rive Gauche circa 1992. Estimate CDN $334 – $502. 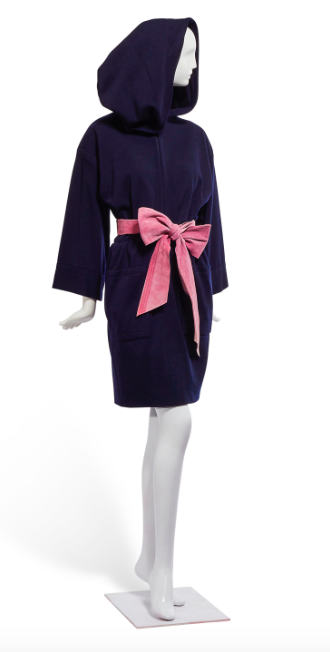 Navy wool hooded dress from YSL Haute Couture Fall/Winter 1985 – 1986. 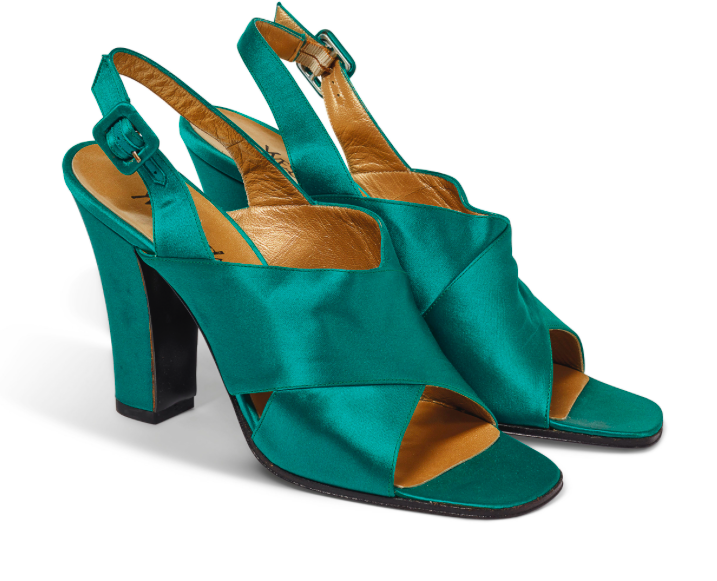 Satin evening shoes YSL circa 1990. Estimate CDN $167 – $334.